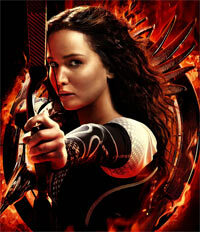 Hunger Games: Catching Fire is clinical at times but nevertheless a smooth ride, according to Paloma Sharma. Haymitch Abernathy’s words ring true through the entire film. Katniss Everdeen (Jennifer Lawrence) and Peeta Mellark (Josh Hutcherson), the victors of the 74th Hunger Games, are on a victory tour of all 12 districts. They are in the public eye 24x7 and must keep up their act of being madly in love if they wish to survive. President Snow (Donald Sutherland), de facto dictator of Panem, views Katniss and Peeta’s combined victory as an act of defiance. Their love gives the people hope, with Katniss becoming its symbol, and hope is exactly what Snow is out to kill. But loyalties within the power circles of the Capitol are changing and Katniss must make a choice, risking all that she hold dear. Jennifer Lawrence absolutely owns this film. Everybody else needs to move over. A lot of attention goes towards Peeta (Josh Hutcherson) and Gale (Liam Hemsworth) but when it comes to male leads, it’s Woody Harrelson as Haymitch -- Katniss and Peeta’s mentor -- who takes the cake. Sutherland makes the perfect totalitarian tyrant. But the real surprises come in the form of Effie Trinket (Elizabeth Banks) and Cesar Flickerman (Stanley Tucci). Even though they are relegated to the sidelines, the show could not go on without these two. The Hunger Games: Catching Fire’s soundtrack has Phil Collins written all over it. Although the music isn't the best coming from artists like Santigold (Shooting Arrows at the Sky), Christina Aguilera (We Remain) and Lorde (Everybody Wants to Rule the World), it works well for the film and adds emotion, something the actors fail to do at times. Every frame is slick, though not as dark as that of the first film despite the characters dealing with extreme trauma in this one. Simon Beaufoy and Michael Ardnt adapt the novel to the big screen quite well but the film seems to drag a bit. While I am not a fan of the non-linear format of story telling, perhaps it could have been used to make The Hunger Games: Catching Fire shorter and more exciting. Elaborate sets and realistic effects sometimes overshadow the actors themselves; and even though the actors do a fine job, it is not always enough for a film of this kind of intensity. Hunger Games: Catching Fire is clinical at times but nevertheless a smooth ride.